On Whit Monday 1861 the foundation stone for a new Sunday School and Preaching Room was laid at Owlerton – which was then a village about a mile from Sheffield. Owlerton Evangelical Church, as it is known today, was founded as a Wesleyan Reform Union Chapel. The late Brian Cocker was the lay Pastor of the church for over 50 years. Brian, who went Home to be with the Lord on Good Friday 2015, was faithfully supported by his wife Anne who continues to serve the church today. Brian managed, along with his brothers, the family scissor manufacturing business in Sheffield for many years as well as leading the church. Both the church and the factory were known for their uncompromising witness to the Gospel. In the Autumn of 2015 the church issued a unanimous call to the Rev. John Diggle to the pastorate of the church which now serves the Hillsborough district of the city of Sheffield. John, in accepting the call, gave assent to the Baptist 1689 Confession of Faith which has been his subordinate standard of ministry in his previous 3 pastorates in London, Durham and Chesterfield. For a number of years John has exercised an itinerant ministry and had preached regularly at Owlerton for the last 25 years. John was formally inducted to the Pastorate on the first Lord’s Day in 2016 by Bernard Wilkinson, the elder brother in the church. 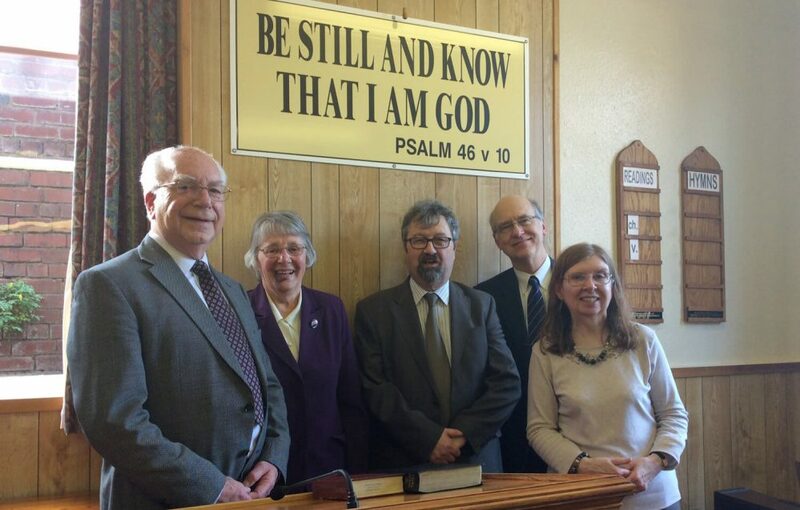 On Saturday 14th May a public Welcome Meeting was held to acknowledge this new chapter in the life of the church which was attended by over 100 people. Dr Derek Linkens, a longstanding friend and preacher at the church, chaired the meeting and Rev. Dennis Hill from Hull preached the Word. The church looks to the Lord as it continues its outreach Gospel Ministry from its chapel in Borough Road to the many homes in that part of Sheffield. In January 2017 the church appointed Darryll Flint to be the Church Evangelist and work alongside the Pastor. During the evening service on the Lord’s Day 18th February 2018 Darryll was set apart as an Elder following a unanimous vote at the church AGM on 29th January. Darryll also has given assent to the Baptist 1689 Confession of Faith.